A small incision is made and the arthritic shoulder joint is exposed. 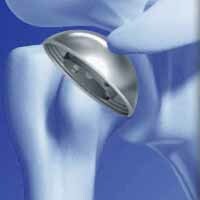 The arthritic areas are scraped away or removed and covered with an implant. The glenoid, or opposite side, sometimes is also treated with a “graft jacket” to cover it and protect it from continued wear. This surgery is generally done as an outpatient procedure with little to no blood loss. Patients may expect to be back at work performing light duties within a week. More healing is required before heavy lifting, or sports activities are to be attempted. If you are certain that resurfacing shoulder replacement treatment is right for you based on a referral from a doctor or recommendation from another surgeon, the highly skilled surgeons at Advanced Orthopedics are a great choice for getting this procedure done. You may have heard about resurfacing shoulder replacement treatment before and are wondering whether or not it is right for you. If you are not sure this is the right choice of treatment you should explore other options to make sure that the treatment you get is definitely the one you need. As a part of Advanced Orthopedics' commitment to our patients, we have put together a quick and easy to use tool to help determine whether resurfacing shoulder replacement treatment is the right treatment for you.